*I will not be responsible for any modifications of the script made by the end users that do not comply with the terms. 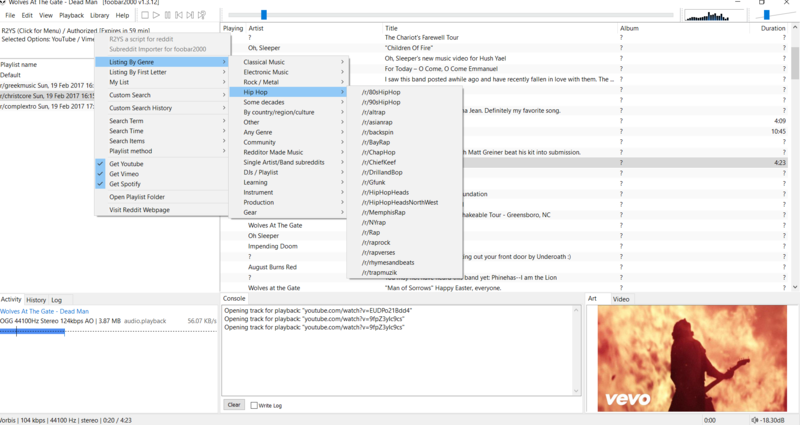 *Search subreddits for youtube/vimeo/spotify url's and create a playlist within foobar2000. *foo_input_spotify (https://github.com/stengerh/foo_input_spotify) Spotify support for foobar2000. Requires a Spotify premium account. *Create an empty jscript panel and import the script. *Modify the script with your oauth2 credentials / or add them in the jscript panel properties. *username and password are your reddit credentials. *You must authorize with your account @ https://www.reddit.com/prefs/apps/ as your personal script to get your client_id and client_secret keys. Reloading or fiddling with the config doesn't help. Can you provide an output from the console panel where it crashes? Same version here. 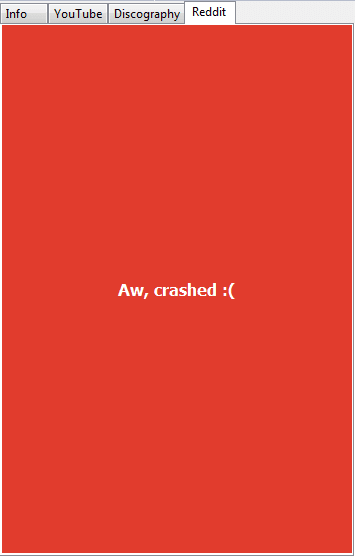 Something else was wrong with my config, because another JScript panel crashes too (YouTube Track Manager). JScript Panel: This component requires your system has IE9 or later installed. So the solution is to install Internet Explorer 9 or later. You can downgrade to v1.2.4 if you wish. fb.Trace has been removed and replaced with a native console.log method so you'll need to do a simple find/replace in all your scripts. It takes multiple arguments as before. And then: enjoy Thanks to zeremy! I uncommented //gr.FillSolidRect(0, 0, ww, wh, g_backcolor); as well because the background was white and you couldn't see the text. thanks @MojoBass @onirwai for reporting. After the first shot where I had no problems to connect to reddit, I wanted to change my password (as I did not want to ues one of my 'good' passwords here). Old clident id with new pwd did not work, so I generated a new script and new client id and secret. However, since then I am not able to connect, not even with a fully new login at reddit (new email, new user,...). Any hints? Try clearing the panel's properties and reload. Right click the panel > Select Properties > Press the clear button > Apply.